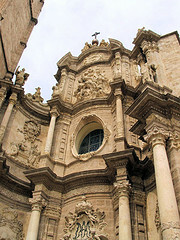 Most top Spanish resorts have lots to see and do which are well documented in the travel guides and brochures. We offer a very personal view below of the two features which we think are the most stunning, unique or typical of the resorts listed. If there was limited time to spend at these resorts, the sites below would be our choice. 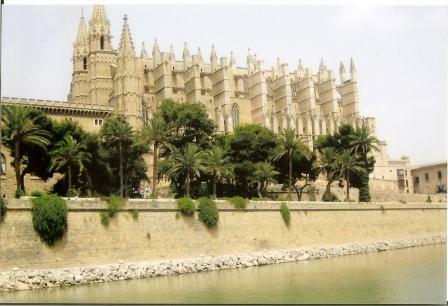 One of the most impressive cathedrals in Europe sits majestically over the city of Palma. Any visit to the wonderful island of Majorca would not be complete without seeing this wonder. If you are seeking refuge from the intense sun, Majorca has just the place. The Caves del Drach are on the eastern side of the island about half an hour drive north from Cala d`Or. These are are without doubt very spectacular limestone caves. They were discovered in 1896 by a French geologist, Edouard Martel. The stalactites and stalagmites have formed into stunning displays resembling all manner of things described as: inquisition chamber; Ariadne`s Labyrinth; Diana`s bath; Fairies Theatre, and so on. 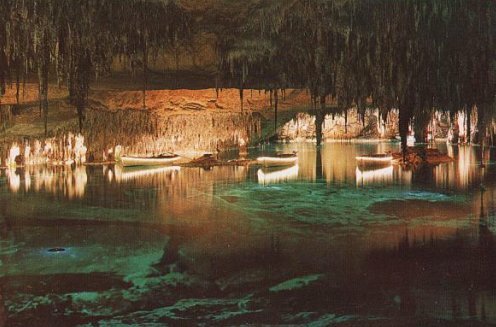 Majorca - caves del drach - underground Lake Martel. 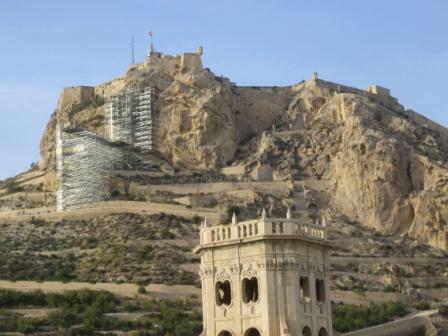 By far the most striking landmark in Alicante is the Castillo de Santa Barbara built at over 500 feet on top of Mount Benacantil. It is easy to believe that historically the fortress was extremely important with its commanding position and views. This photo was taken from the roof of the Mediterranean Plaza hotel over the top of the stunning Ayuntamiento. The panorama and views from the top are incredible. The famous ‘Explanada’ is an elegant promenade running along the edge of the port, and connecting new developments at both ends of the splendid marina. This shot was taken at an unusually quiet time. The pattern has a mesmerising effect if you stare at it for too long! 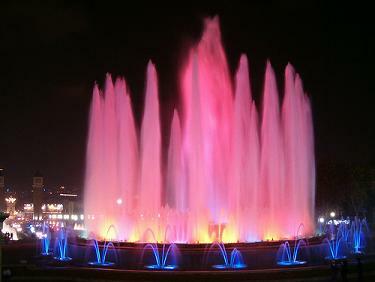 Visit Montjuïc and the famous MNAC at night and you will be treated to the Magic Fountains (Font Màgica). Watch as the fountain dances to the music and changes colour. This pretty plaza is just behind the old town and is an oasis of calm from the busy Calle Ramon Gallud. A small fountain frames the ancient church of the immaculate conception. Take a break under the palm trees or sneak a look in the ornate church. 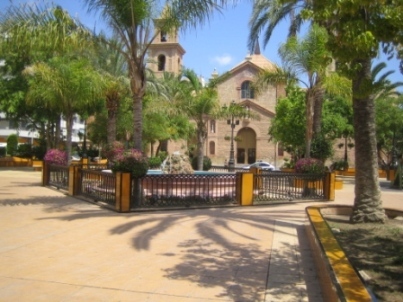 Torrevieja - plaza de la constitucion and iglesia de la inmaculada concepcion. 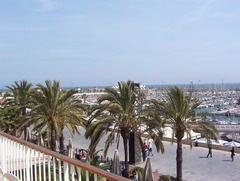 Torrevieja has worked hard to create a promenade along most of its seafront. 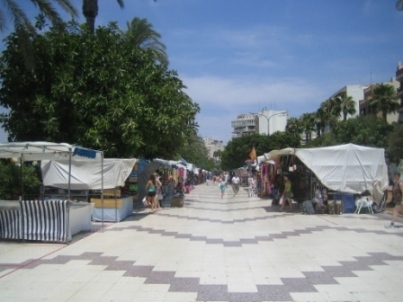 The Paseo de la Libertad is typical of this achievement, and also is home to an interesting selection of shop-stalls. 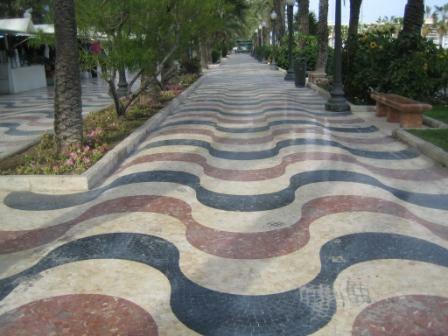 An incredibly unusual area between the paseos Pau Casals and La Playa. 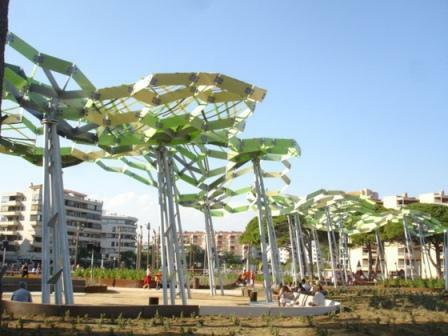 These structures are 9 metres tall with an hexagonal form to simulate pine trees and provide shade. 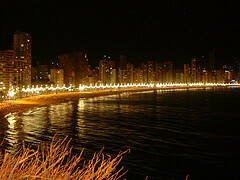 The night time illumination of the high rise seafront and promenade along the Playa Levante is spectacular. 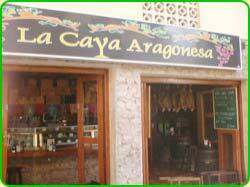 The authentic Spanish ambience of this popular tapas bar in the old town is unforgettable. Try a selection of their great choice of nibbles and wash down with a glass or two of Cava. La Manga is a fascinating area, a strip of land, 22 kms long and 50 to 1500 m wide, separating the Mediterranean from the inland sea, Mar Menor. 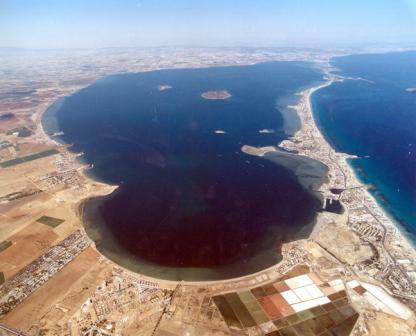 Thousands of years ago it was a large bay, but gradually a long underwater ridge built up to create its present appearance.It lies to the southeast of Murcia province and the nearest airport is Murcia San Javier, about 40kms away. 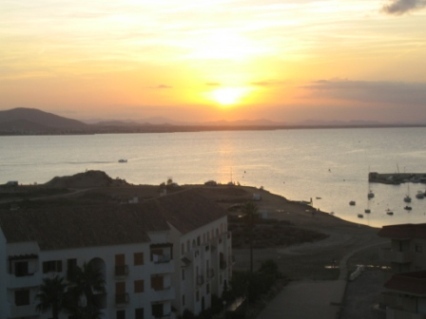 This view of the southern end of the Mar Menor was taken from the Hotel Gaviotas. The panorama is stunning and the extensive Mar is always tranquil and awesome. 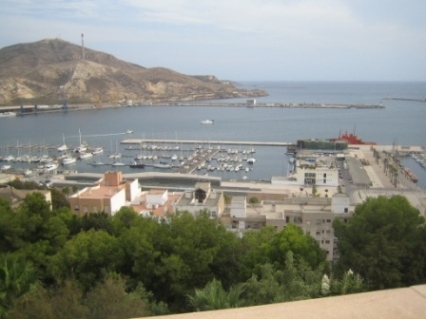 This pretty harbour is located just south of La Manga del Mar Menor and has been tastefully developed in recent years. There is a modern development around the sheltered leisure marina, which is also used as a centre for a bustling diving school. 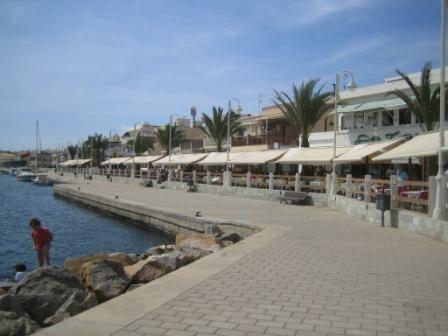 At the seafront the promenade provides access to a good selection of restaurants and villas to rent and owned. 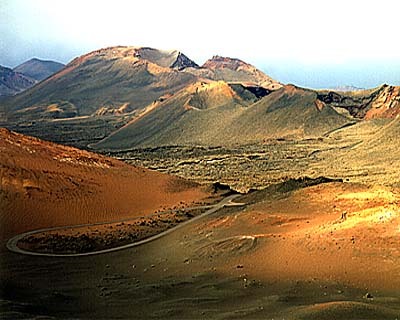 Like all Canary islands, Lanzarote is volcanic and certainly one place not to miss is Timanfaya, the national park of volcanoes. Two hundred years ago there were some major eruptions lasting for several years which swamped a large area with lava and ash. Today, there are demonstrations of the latent heat still prevalent just below ground level. Park staff show how dry straw spontaneously bursts into flames when placed in contact with the ground just a couple of feet below the surface. 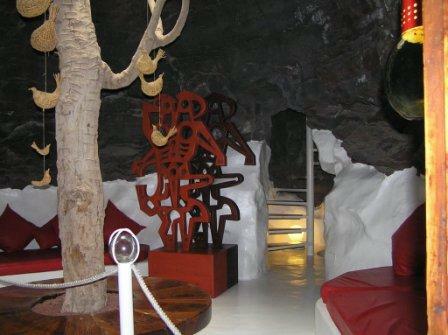 The César Manrique Foundation is full of works of this modern day artist and architect including his own unique house in Tahiche.It was built in 1968 on the site of a lava flow dating back to the eruptions two hundred years ago. It takes advantage on its lower level of five bubble shaped cavities formed by volcanic action. They are a surprising example of how the result of natural volcanic activity can be utilised to create real living space. This elegant modern resort at Playa Blanca has all the facilities you could ever want for a fantastic vacation. 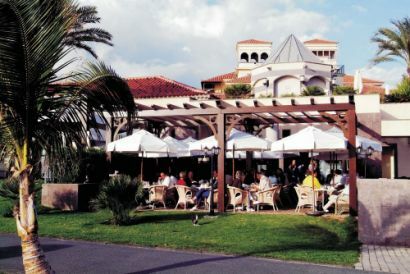 Adjacent to the Gran Melia Volcan 5 star hotel and large leisure marina, the Rubicon offers the full range of watersports, tennis, art gallery and shopping along the attractive El Paseo. It also enjoys a great selection of good quality restaurants and bars. 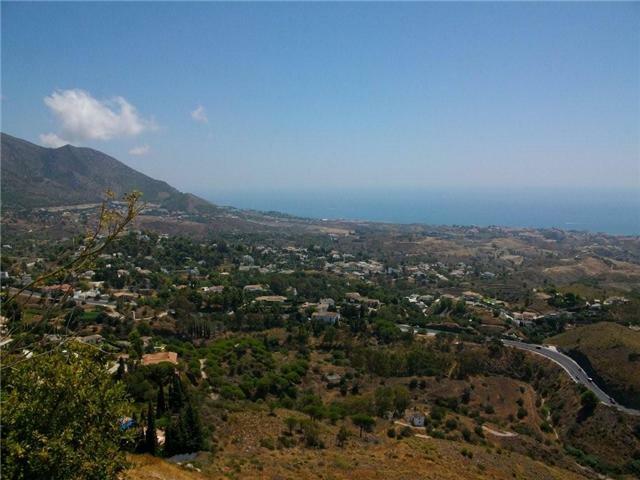 As well as being one of the prettiest towns on the Costa, the views from Mijas are stunning. No wonder thousands of tourists visit every year. 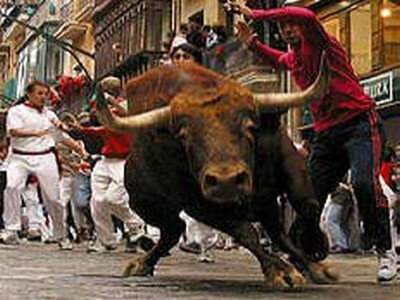 The festival of San Fermin and the running of the bulls (el encierro) take place in Pamplona, Navarra, every year in the second week of July. 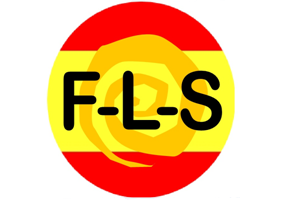 Whilst San Fermin was originally a religious festival in celebration of the patron of Navarra, Saint Fermin, the tradition of the running of the bulls has meant that this fiesta has gained international recognition and is now much more than a local religious celebration. La fiesta de San Fermin y el encierro tienen lugar en Pamplona, Navara, cada año en la segunda semana de julio. Mientras que San Fermin era originariamente una fiesta religiosa en celebración del patrono de Navarra, San Fermin, la tradición del encierro ha traído esta fiesta recognición internacional y ahora se trata de mucho más que simplemente una celebración religiosa local. Near to the famous lighthouse at Maspalomas there is a new development of interesting chic shops and businesses.Turn left and you are soon into the Meloneras district with an excellent selection of restaurants and further designer shops and the comprehensive Faro 2 shopping mall. In an evening there is usually some good live music at one or two of the bars in this area. When it’s time to go home, the taxis are plentiful and cheap. This is a spectacular stretch of 400 hectares of sand dunes. This mini wonder of the world separates the elegant Maspalomas resort of luxury hotels and villas from the more downmarket but popular resort of Playa del Ingles. 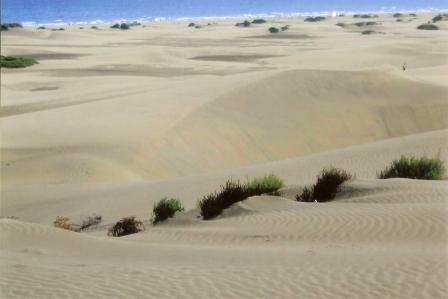 The dunes are a natural protected area and habitat for a number of rare plant species some of which are unique to the Canaries. If you walk into the middle of these dunes you could imagine being in the deserts of Africa, so take care and plenty of water and hats! 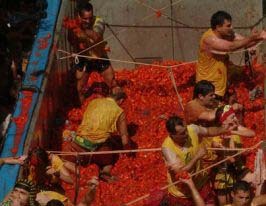 La Tomatina consists of a massive tomato fight held in the town of Buñol, 38km from Valencia, normally held the last Wednesday of August. Approximately 30,000 people from all over the world arrive early in the morning to fight in the battle in which about 150,000 over-ripe tomatoes are hurled in the streets. 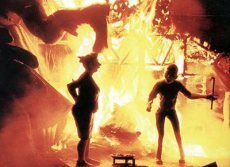 Bearing in mind that the normal population of Bunol is 9,000, one can imagine that the town is hurled into chaos for this messy festival. 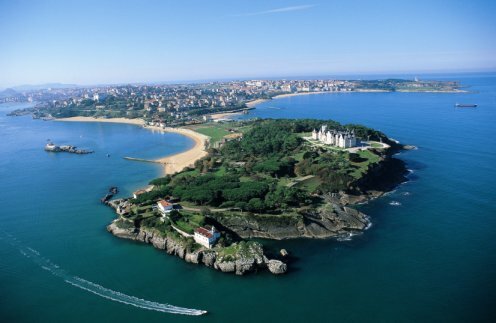 The Magdalena peninsular is a particularly beautiful and fascinating area for strolling on a fine day. There is an impressive variety of shrubs and plants, particularly encircling the Palacio de la Magdalena. This stunning palace in white stone has a somewhat familiar English look about it, but it has actually been the home of former Spanish royalty. However, it`s now the HQ of the Universidad Internacional Menendez-Pelayo offering a variety of courses to international students. Cartagena is quite a large city with a population of about 200,000. It has always been an important naval station because of its large sheltered natural harbour, and big shipyard. In more recent times it has grown in popularity as a tourist destination and the city has worked hard to stimulate this development. Magnificent panorama from the grounds of the castle on top of Concepcion Hill. 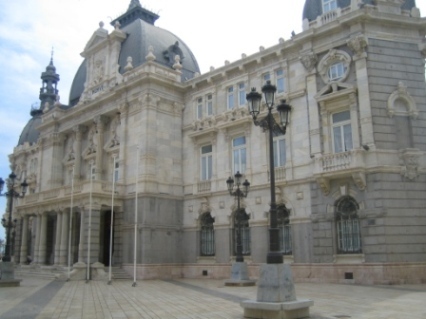 The Ayuntamiento of Cartagena has got to be one of the finest in Spain. The city has significantly invested in the surrounding marble-like plaza. Mount Montgo towers over the town of Denia on the northern Costa Blanca. The views from the mountain are phenomenal.